SAALT Chicago Townhall: The Future of South Asians in the U.S.
Join us to learn about how we can all build The Future for South Asians in the U.S. on Saturday, October 6th in Niles, Illinois. South Asian Americans Leading Together (SAALT) will be partnering with Chicagoland community organizations to host this critical forum addressing the impact of immigration policy in the U.S. on the South Asian community. A Resource Fair, featuring local South Asian community organizations. The Resource Fair will allow community members to connect with local organizations serving and working with South Asian American communities. 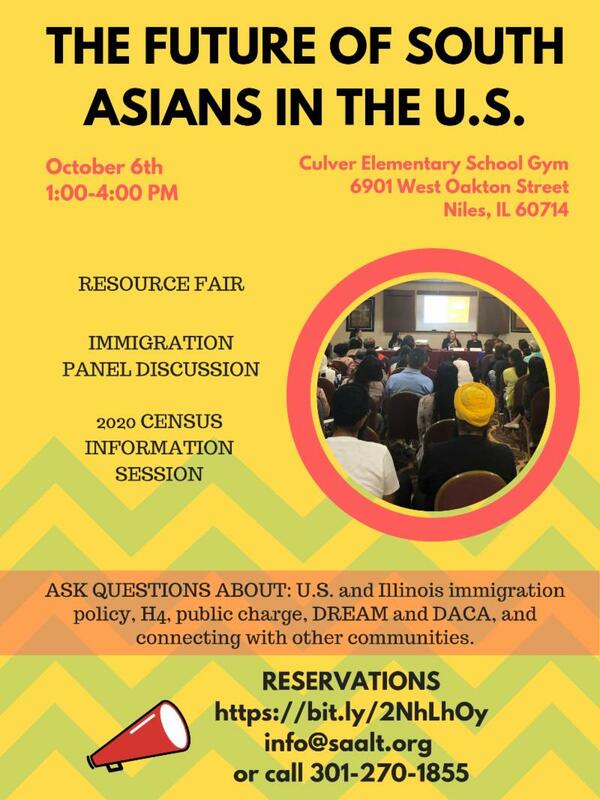 Indo-American Center, South Asian Americans Policy and Research Institute (SAAPRI), Hamdard Center, Apna Ghar, the Council on American Islamic Relations – Chicago (CAIR-Chicago), and more local organizations will be available to answer your questions aboutimmigration, health care, public benefits, and DACA. There will also be a panel discussion with local advocates for the South Asian community, sharing how current national and state-level policies affect our communities, H4 visa holders, DACA recipients, and the DREAM Act. There will also be information about the 2020 Census, and how proposed changes will likely impact the South Asian community. For a full list of our co-sponsors and speakers please visit and RSVP on our Eventbrite page for The Future of South Asians in the U.S. on Saturday, October 6th at Culver Elementary School. This entry was posted in alerts, press releases by SAALT. Bookmark the permalink.